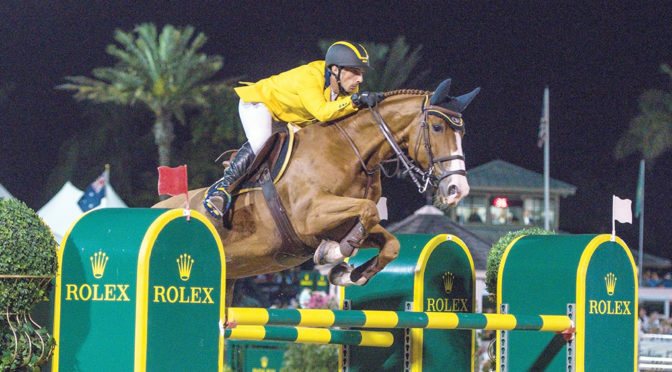 Brazilian show jumper Yuri Mansur Guerios hails from Sao Paulo in the southeast of Brazil. He’s easy to spot on the course in the colorful yellow jacket representing his homeland. While he had long been fascinated by horses, opportunities were limited. He got a late start in the horse world, competing in his first 1.35m class at age 18. An opportunity in Belgium introduced him to the European equestrian circles, where he eventually became a groom and later rider for Belgian show jumping Olympian Ludo Philippaerts, which really started his career. He later returned to Brazil and began a horse business, which included importing horses from Europe. He eventually came to dominate South American shows and had some success abroad, where he has represented Brazil on Nations Cup teams after being vice-champion of Brazil twice and qualifying for the World Cup Final three times. In Wellington, Mansur and Babylotte topped 82 other entries to win the $35,000 Rose Hill Farm 1.45m Classic CSI2* last season. After being a reserve rider for Brazil in 2014, Mansur competed at the 2018 World Equestrian Games in Tryon, N.C., with his mount Ibelle Ask.